The amount charged above is for one PokerEduManager license. The license gives you access to all features and future patches of PokerEduManager. The license can be used to install PokerEduManager on two computers. IMPORTANT - Your license key is emailed to you immediately after successful payment through PayPal. If you're not automatically directed back to our website please click the "Return to PokerEduManager" button. When you download and install the PokerEduManager Software Suite the installer will install three applications on your system. The Main Application, Quiz Creator and Stand-Alone Messaging Application. The Quiz Creator and Stand-Alone Messaging Applicationa are license free. The Main Application has to be licensed after the trial period of 30 days expires. During the trial period you can use the Main Application to it's full extent and we encourage you to use this period to fully explore our product. Yes you can. With one license key you may license PokerEduManager on two computers. Should you've used your license key to activate two machines and get a new laptop, you can reset your license key in the main applications preferences. This will reset your key and you can install PokerEduManager on a new system. PokerEduManager supports all major consumer versions of Windows. Currently we only accept payments using PayPal. In case you don't have a PayPal account you can also checkout your license purchase using your credit card on PayPal's secure checkout page. 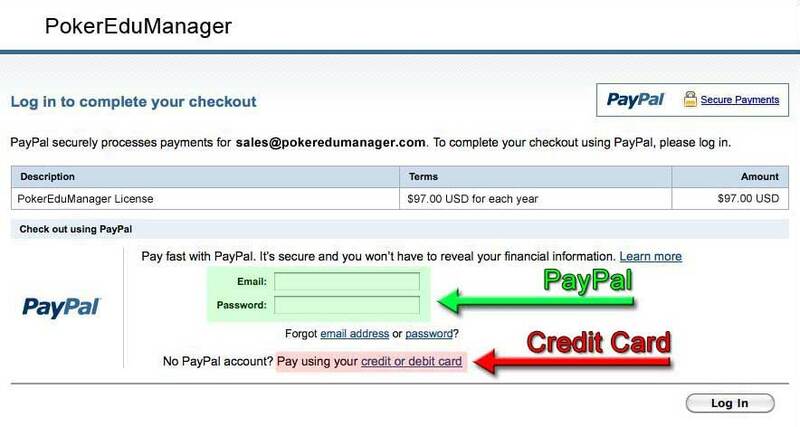 When you click the Checkout button above you will be taken to PayPal's website to pay for PokerEduManager. If you would prefer an alternative payment method please contact us and we will do our best to accommodate your request. 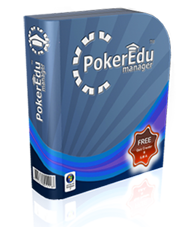 We do encourage you however to take advantage of our free trial to evaluate PokerEduManager before buying a license.